Certain albums invite a bit of contemplation — just a little time to let the music sink in and simmer — before some telling aspect, be it a particular lyric or chord progression, tugs at one of your proverbial soft spots, bringing everything into focus. 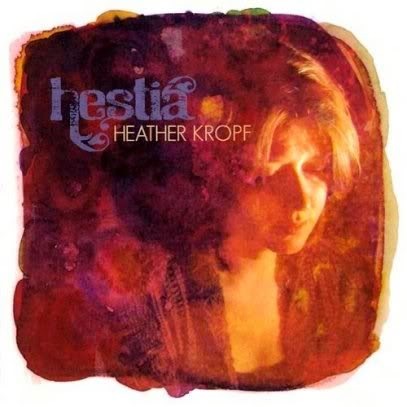 With its melodic subtleties and deceptively simple songs, such a depiction could fairly apply to Hestia, the third and most recent release by Heather Kropf. For those unfamiliar with the singer/songwriter and her music, Kropf affects a soft, bittersweet voice — imagine an audible brew of Shawn Colvin, Suzanne Vega, and Kasey Chambers — while, musically drawing upon contemporary folk as imparted, for the most part, on piano. Named after the Greek goddess of the hearth fire who oversaw domestic life, Hestia aptly reflects a placating, insulated sort of serenity. Supported by sparse, delicate arrangements — all but one track underscoring Kropf’s rich piano playing — the music elicits an ethereal, often melancholy dimension. The songs themselves — some having been culled and re-worked from earlier compositions while others mark their first appearance on record — are evocative vignettes, as intriguing in their lyrical abstractions as in their fragile sound. From the narrative enigma in “Grace” — “She’s looking through the keyhole/ You gonna ask her in?” — to the modest mysticism summoned by a pedal steel in “Kite,” Kropf endears herself as an artist of sensitive depth and resonance. Most striking is “Devolving,” in which Kropf envisions a dark, swirling haze of imagery — “Let the winter wind blow cold now/ To clear the evidence of what’s gone down” — as an ominous clarinet complements an otherwise minimalist, unwavering motif. It’s the kind of song that has you figuratively grasping for a revelation, all the while leaving you happily immersed in its haze. Hestia is also that kind of album. Heather Kropf doesn’t come off here as a starkly confessional or cathartic sort of singer/songwriter. Rather, she sounds like she’s tapping into subconscious terrain, unearthing impressions that aren’t yet crystallized or perhaps even understood. And it’s amid such emotional obscurities that Kropf makes compelling music.